Traditional micropiles are small-diameter steel rods or pipes installed in concrete-filled drill holes. They are used most often in groups to transfer bearing loads to deeper regimes. Engineers at GeoStabilization International® have discovered that micropiles also can be used to prevent scour at new constructions and repair existing scour holes and degrading stream beds. Beyond the basic benefits of cost-savings and avoiding or minimizing rip rap installations, this new micropile application-especially when combined with our GCS® technologies-encourages the use of aquatic- and terrestrial-friendly open bottom boxes and bridges. And because Launched ScourMicropiles™ are installed with our Soil Nail Launcher™, stream encroachment and other collateral damage is restricted practically to those areas of future disturbance. Moreover, with the Soil Nail Launcher™, there is no need for polluting drill rigs or fresh concrete around the stream or riparian zone. Launched ScourMicropiles™ zip into the ground at 220 miles per hour and set up as if they are in concrete. They are instantly ready for work! Launched Nails achieve significantly higher pullout capacity than driven nails. Once the Launched ScourMicropiles™ are installed, appropriately graded alluvium can be added to fill the scour hole and create a ramp, eliminating the waterfall. Fish passage can be maintained, even in severe conditions. 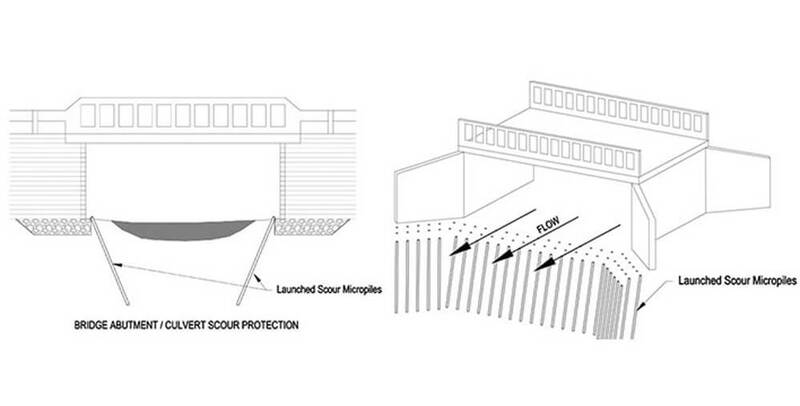 The diagrams show that if a fraction of the alluvium is larger than the spacing of the Launched ScourMicropiles™, the micropiles’ three-dimensional cage effect will contain the particles and create a barrier to scour. If the stream bed is fine grained, then placement of appropriately graded rock on the array and upstream is a solution. As the material scours, these rocks will migrate down and fill into the matrix, creating this scour barrier.